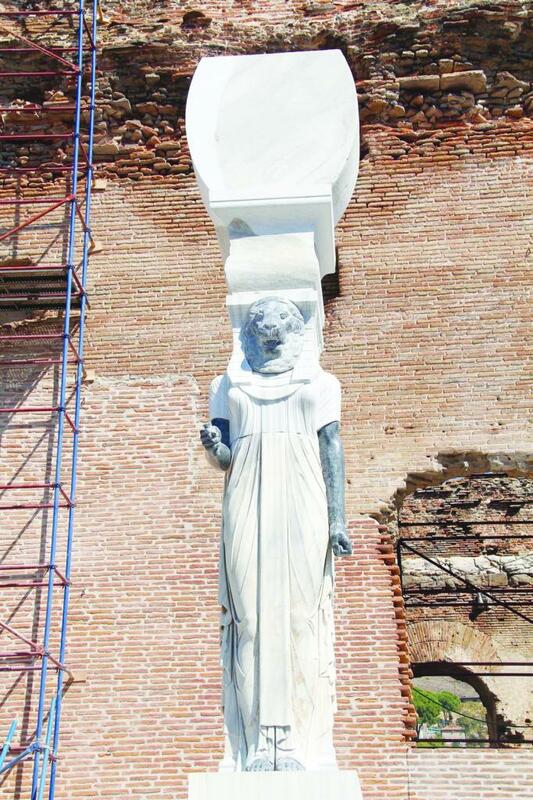 TURQUIE – Pergamon - An almost nine-meter long lion-headed Egyptian goddess Sekhmet has been revived in the Red Basilica (Kızıl Avlu) in the largest structure of the ancient city of Pergamon in İzmir’s Bergama district. German Excavation Institute Chairman Ferix Pilson said it would contribute to Bergama’s inclusion in the UNESO Cultural Heritage list in June next year. The Egyptian statue pieces found during the excavations since 1930 in the Red Basilica are among the most important statues from the Roman Empire. 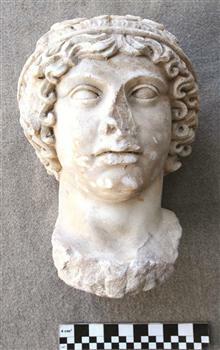 Among them, the lion-headed goddess statue was reconstructed thanks to the support of the Studiosus Foundation. The statue was raised last year for trial purposes and with further works, and it reached an impressive height of 8.5 meters. ROYAUME UNI – Maryport - Archaeologists, volunteers and trainees working near the Senhouse Roman Museum have revealed the remains of six buildings, including at least one shop, and a Roman road. Detailed geophysical surveys by Oxford Archaeology North revealed lines of structures likely to be buildings either side of the main street running from the north-east gate of the fort. The dig, overseen by the Hadrian's Wall Trust, has confirmed the survey results. Stephen Rowland, the project manager for Oxford Archaeology North, said the building that archaeologists had spent most of their time examining “might have been a shop at some point during its use”. "The reason we think it may have been a shop is the fact there isn't a stone wall at the end facing the road. Instead, there could have been a booth-like timber frontage, or perhaps double doors that have long since rotted away." This kind of construction has been found at other sites. At Maryport the team uncovered possible evidence of a stairwell that may suggest people would have worked on the ground floor and lived upstairs. “We haven't yet been able to determine what was sold here,” added Rowland. "But we have found a large in situ sharpening stone, and lots of smaller whet stones for honing blades and tools." Other small finds from inside the building include glass beads, remains of pots for processing food, fragments of amphorae that could have contained oil or wine, glass vessels and a spindle whorl. To the back of the building a yard area is surrounded by a ditch and several pits have been found that could be outside toilets or rubbish pits, together with three square wells or cistersn for holiduing water. Evidence at the site, which appears to date to the second and third centuries AD, points to the site being abandoned, like many settlements along the frontier, in around AD250. Earlier excavations on the fort show that it was occupied through the third and fourth centuries, while the recent excavations by the Newcastle University on Roman Temples at the site revealed evidence of a late fourth century building on top of the hill. PEROU – Paracas - the Museum of Archaeology, Anthropology, and History is home to a fascinating collection of artifacts from the Paracas culture. The Paracas culture lived in southern Peru from around 800 BC and 100 BC. They’re known primarily for their complex and multi-colored textile products, many of which have remained preserved for millennia due to the dry desert weather in the Paracas area. Archaeologist Julio C. Tello, considered the “father of Peruvian archaeology,” discovered the first remains of the Paracas culture in 1925. The new Paracas room will include a wide variety of items, including human skulls, children’s toys and games, textile items, and a study of Paracas tattoo art. Andina news agency writes that out of 56 total textile items included in the new exhibit, 41 have never before been publicly displayed. TURQUIE – Milet -During cleaning works of an inn in the ancient city of Milet in Ankara, terracotta finger figures as well as sculptures have been discovered. The artifacts show that the inn served as a holy site in ancient times. The finger figures are similar to the ones found in Corinth and southern Italy and such cult objects were presented to gods and goddesses with the recovery of those who had fallen ill in mind. The sculptures were also found in a one meter-deep rectangle-shaped well. It is speculated that someone hid the sculptures in the inn’s well during the period when emperor Theodosius I forbade such cults. Among the artifacts found in the well were oil lamps dating back to 4th and 5th centuries and roof tile pieces. It shows that the inn ceased serving as a holy site from this century.